Our courses are ideal for people of all levels who want to prepare for anything from weekend trips to long-term cruising. It is a challenging program. The coast is where all the action is: heavy commercial traffic, tides and currents, variable bathymetry, and shifting weather. Most of our training courses run in the shoulder season when winds are stronger and the sailing is fantastic. On days when the weather doesn’t challenge you, we will “stir the pot” with a few drills and scenarios. And if dangerous weather is approaching, such as a hurricane or lightning, we will seek a secure anchorage – which will give you the opportunity to stand anchor watch in a crazy storm! We’ll also sail overnight, so you’ll get the experience of standing a navigational watch through the night as well as sleeping underway. If you are planning to cruise long distances, any of these courses are ideal. Read more about what to expect. So be sure to do both! These 6-day and 4-day expeditions, pack in a lot of drills, skills, and fun. We’ll sail towards Norfolk and the mouth of the bay. We’ll be sailing into the night as we try to make maximum miles. Like all our courses, it will be intense training, and on-the-go learning combined with sit down lessons and discussions. After a long day of hard work, you’ll be rewarded with a cozy picturesque anchorage. 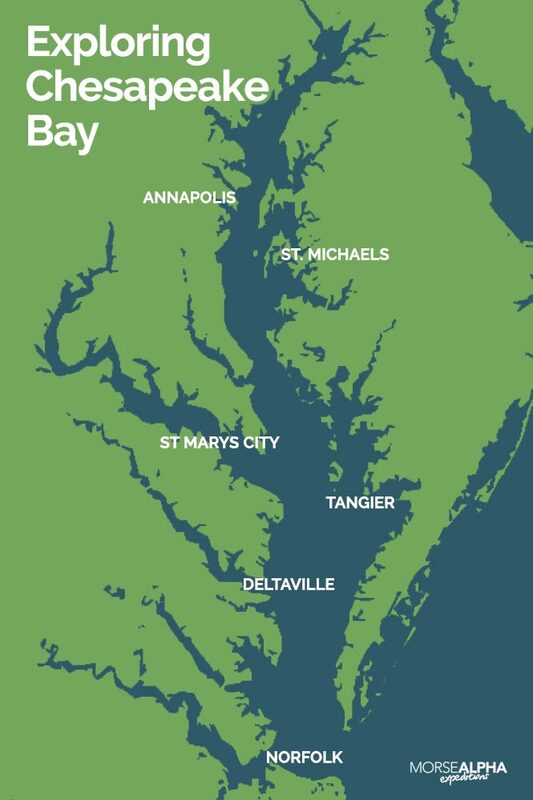 We’ll try to explore the Southern Chesapeake, and maybe even get to Tangier Island. Motivated crews may decide to make a stop in St. Michaels for crabs and a visit to the maritime museum. Fall is a great time to be sailing the bay! The winds are stronger and the days are cooler, and you’ll have to tuck in a reef or two on our way to some cozy anchorages. We’ll take advantage of autumn winds and frequent frontal passages to pack in lessons, navigation, drills, scenarios, and fun. We’ll sail towards Norfolk and the mouth of the bay. We’ll be sailing into the night as we try to make maximum miles. Like all our courses, it will be intense training, and on-the-go learning combined with sit down lessons and discussions. We’ll explore the Southern Chesapeake, and maybe even get to Tangier Island. We also offer customized vacation charters, and sometimes do deliveries. Contact us to find out more.